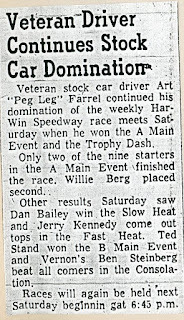 There are gaps in the coverage for the 1967 season. What is covered is done pretty well, so maybe I just missed something. 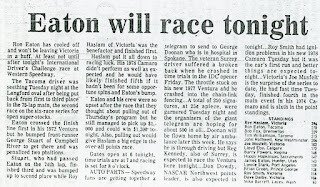 Somehow the first race didn't make it to the paper (or I flat out missed it). 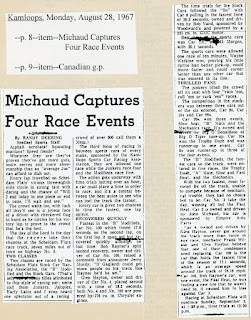 This looks to be the second race report. 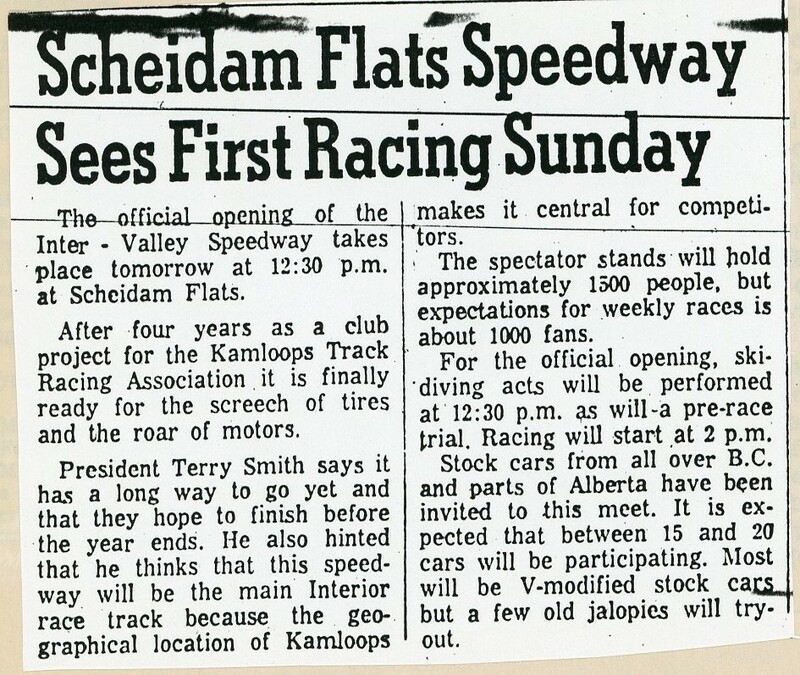 A look at the opening season at Kamloops' Inter-Valley Speedway. A t.v. show actually. 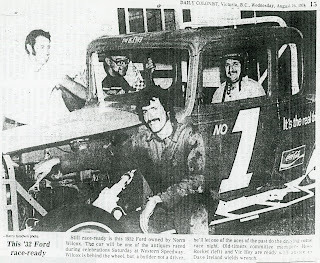 Roger Moore passed away this past week. 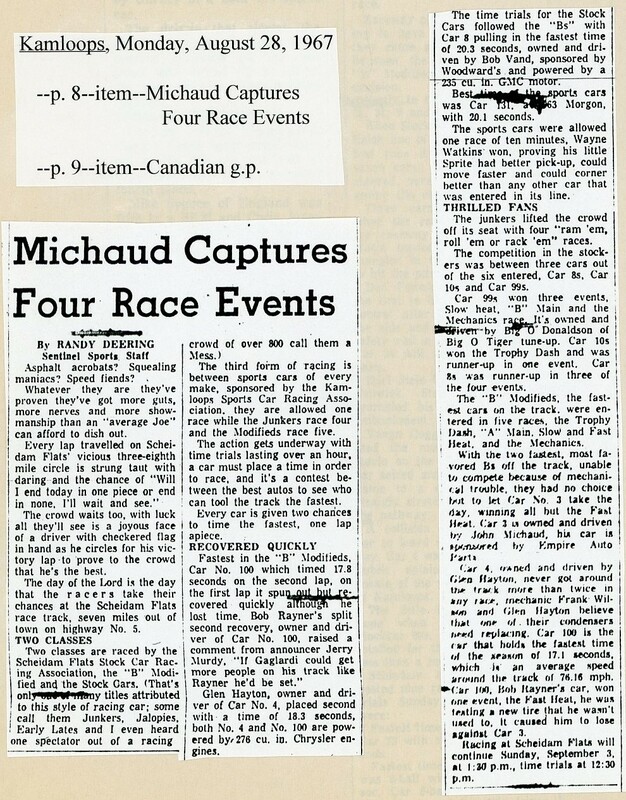 Here he is from The Saint with a racing episode. 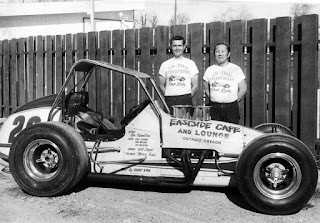 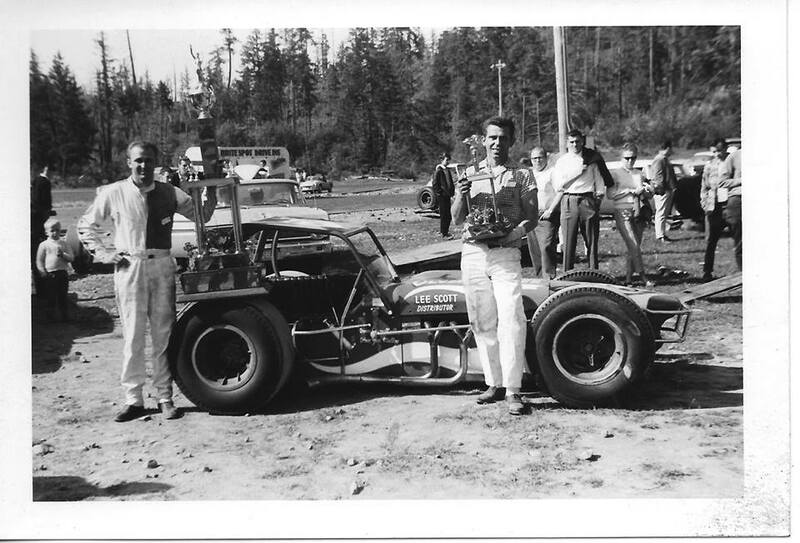 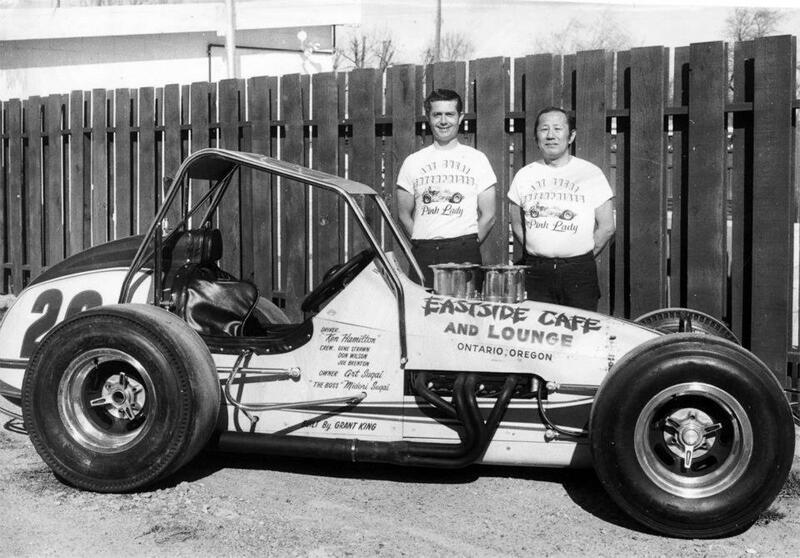 From Idaho, modified racer Ken Hamilton, born May 23, 1941. 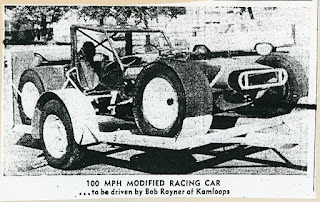 Another CAMRA racer. CAMRA racer Jim Malloy was born May 23, 1932. 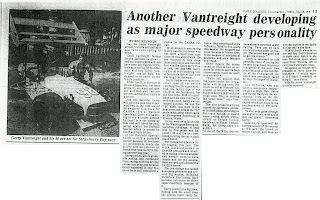 He died in a practice accident at Indianapolis May 18, 1972. 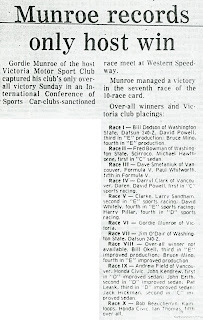 He was CAMRA champion for the 1964 and 1965 seasons. 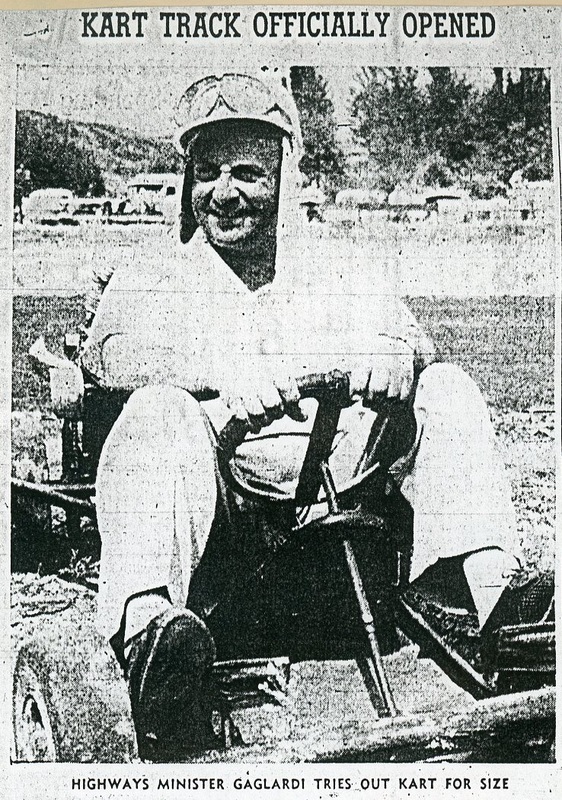 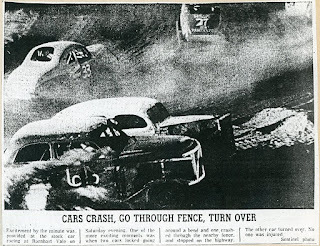 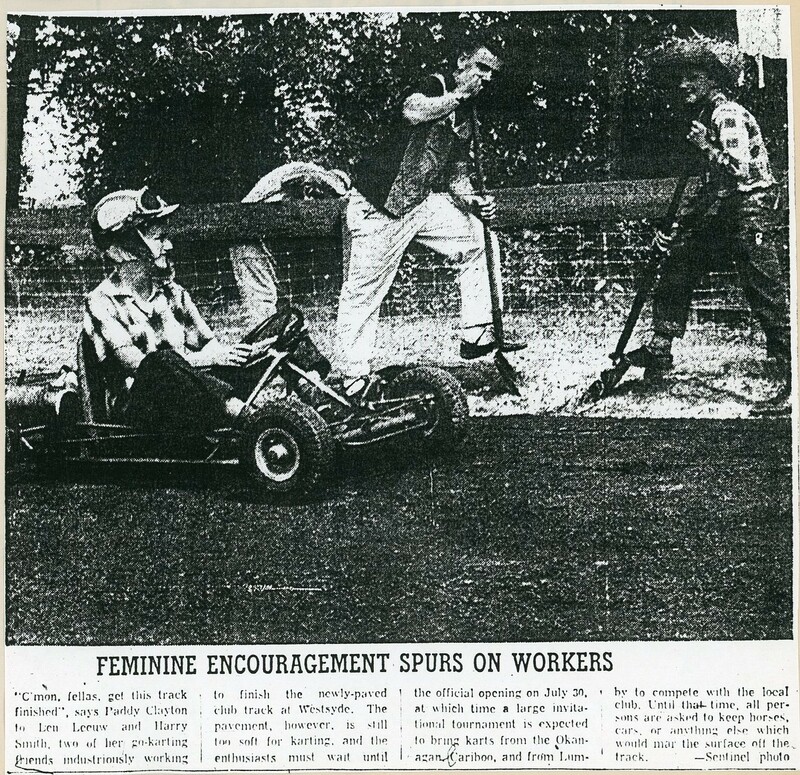 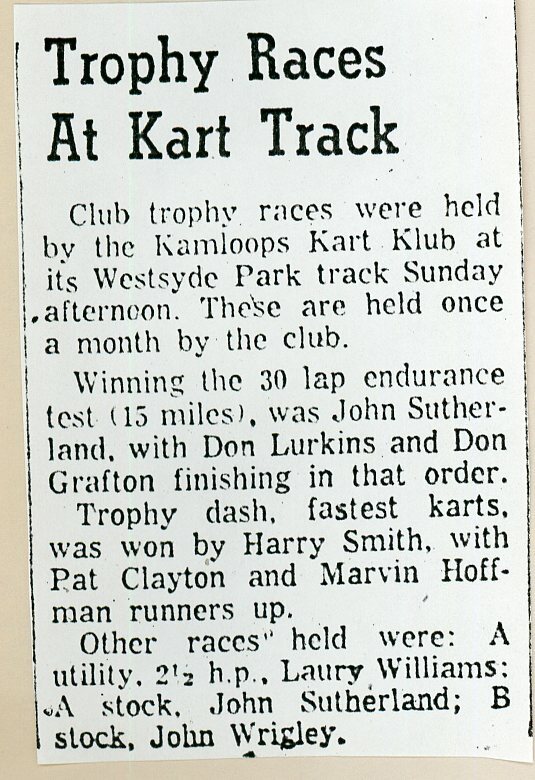 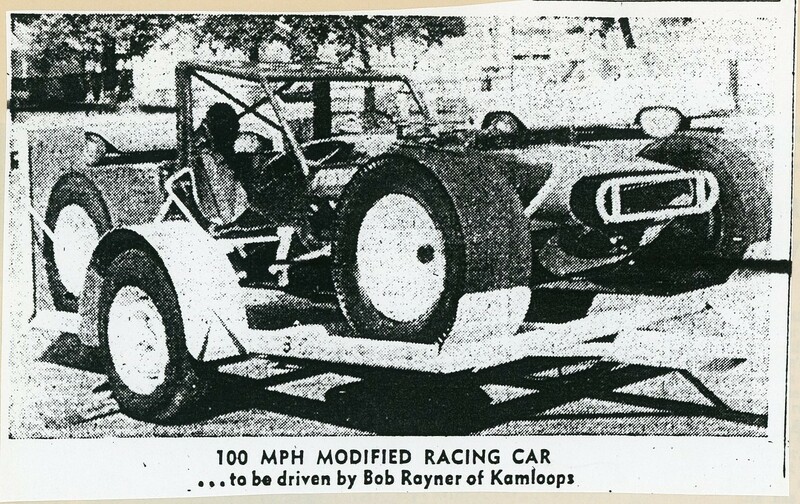 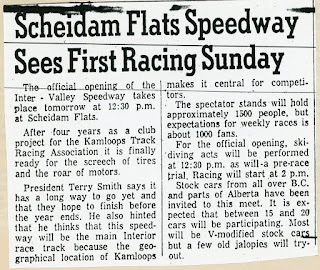 Two final clippings from the Kamloops karts, 1961. 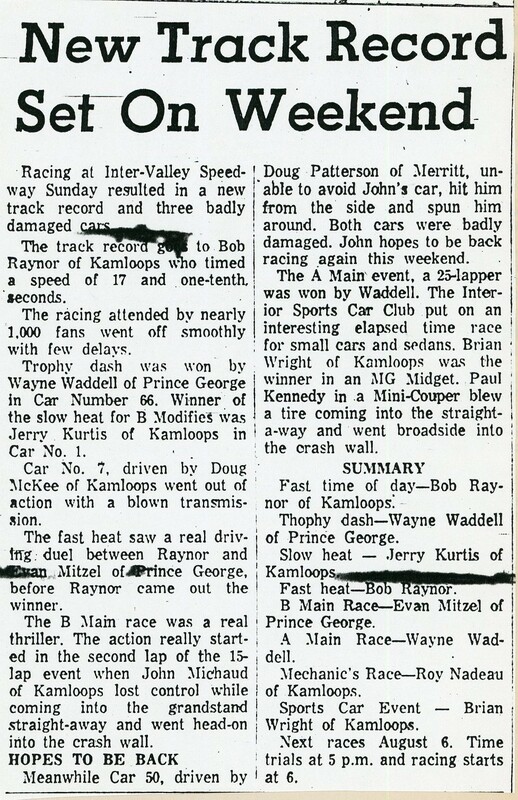 The full opening day report for the karts at Kamloops. 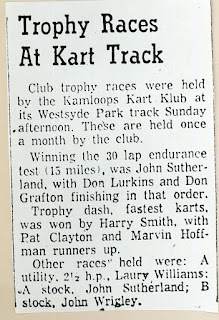 The new sport of kart racing came (kame?) 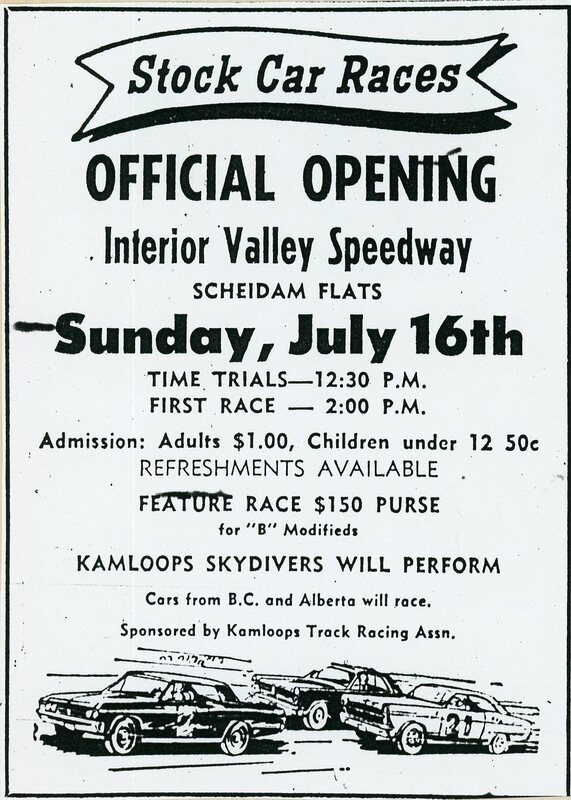 to Kamloops in 1961. 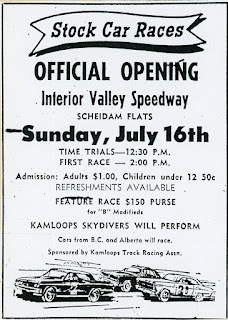 Phil Gaglardi was there to open the track. 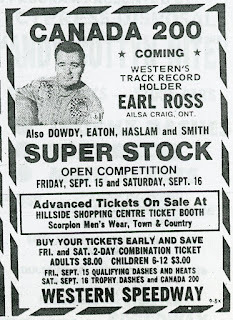 The season winds down with less information. 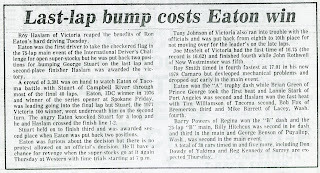 But it looked to be a good season. 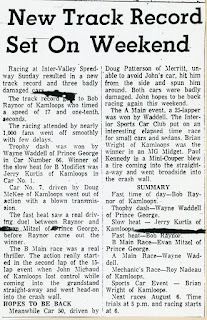 A pretty successful looking season for the Kamloops track (is it Har-Win or Harwin?). 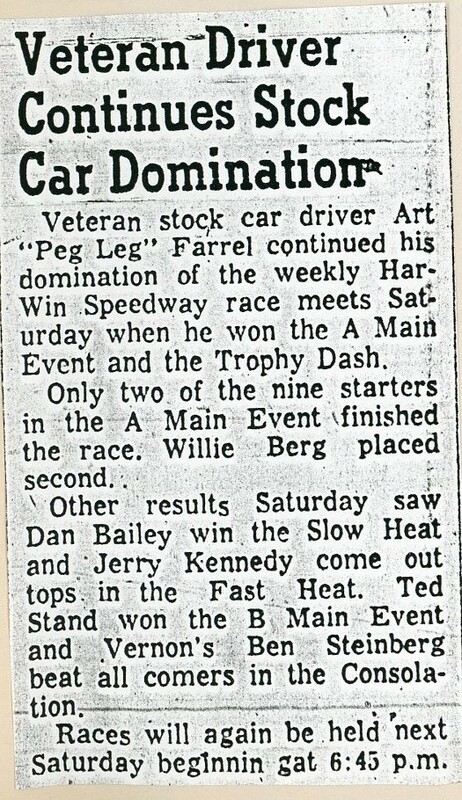 West coast driver Art "Peg Leg" Farrell did well up at Harwin. 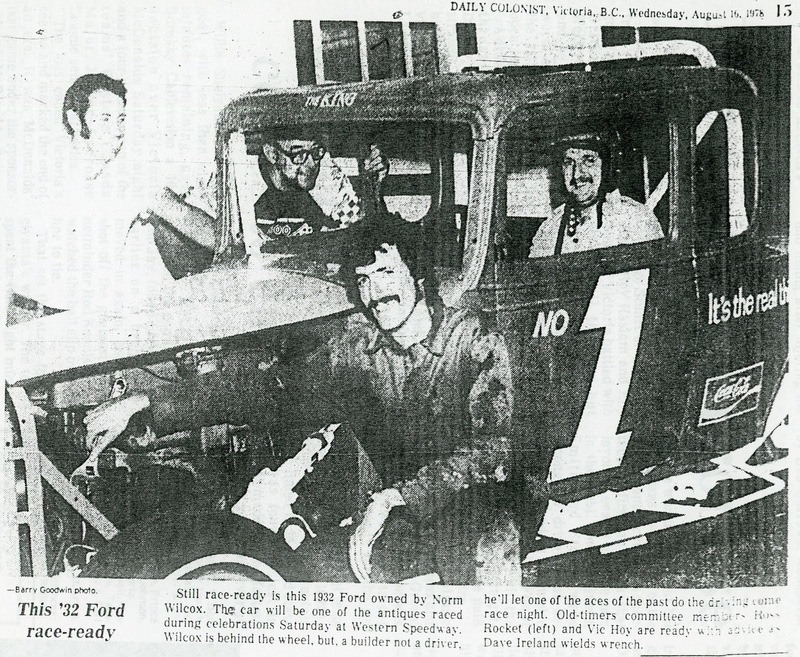 He had his start at Digney Speedway and went on to race at Haney. 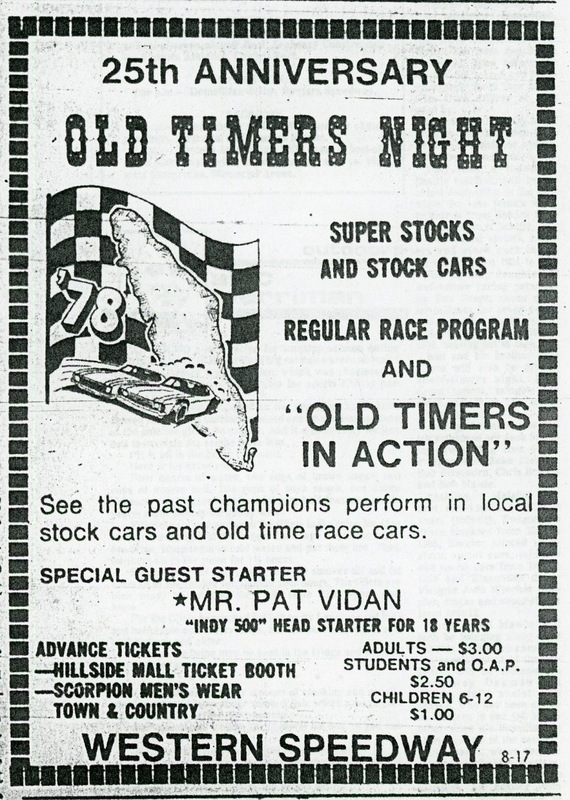 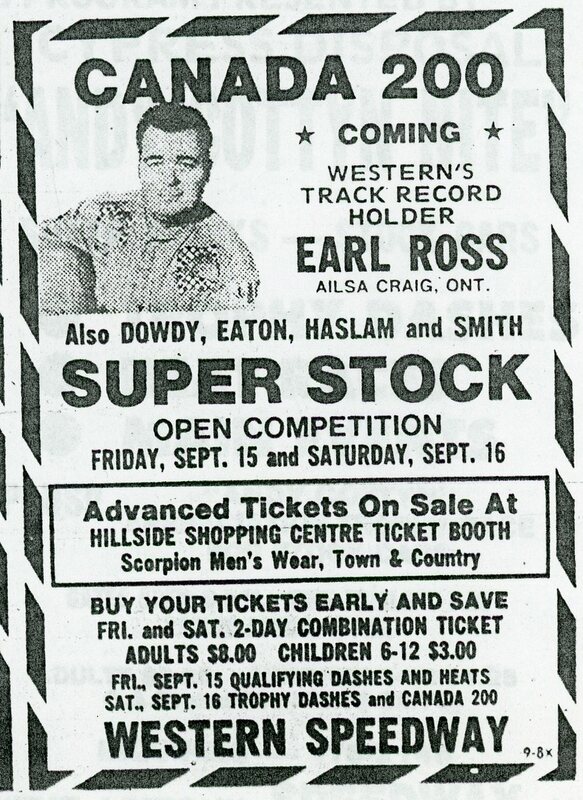 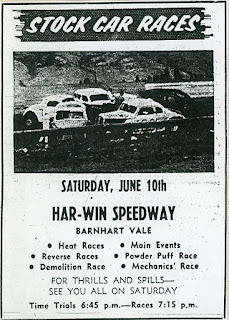 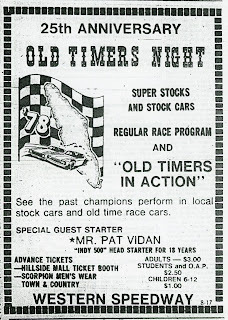 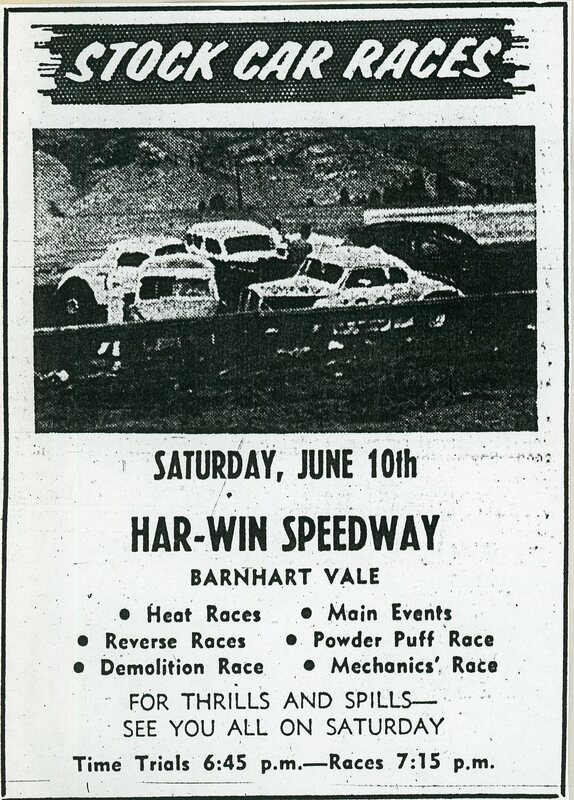 A few years ago I posted an ad for Harwin Speedway's opening in 1961. 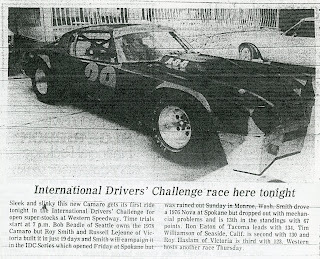 Here's a few clippings from that first season. 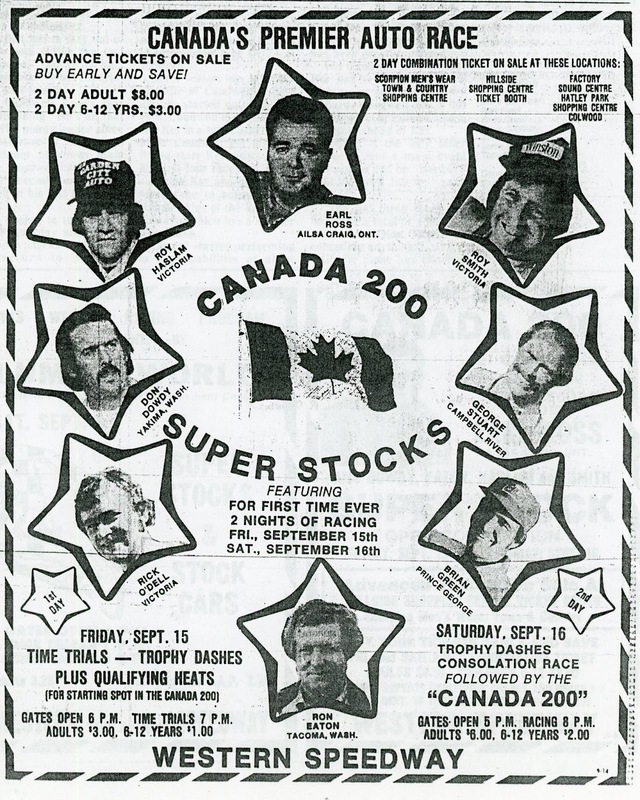 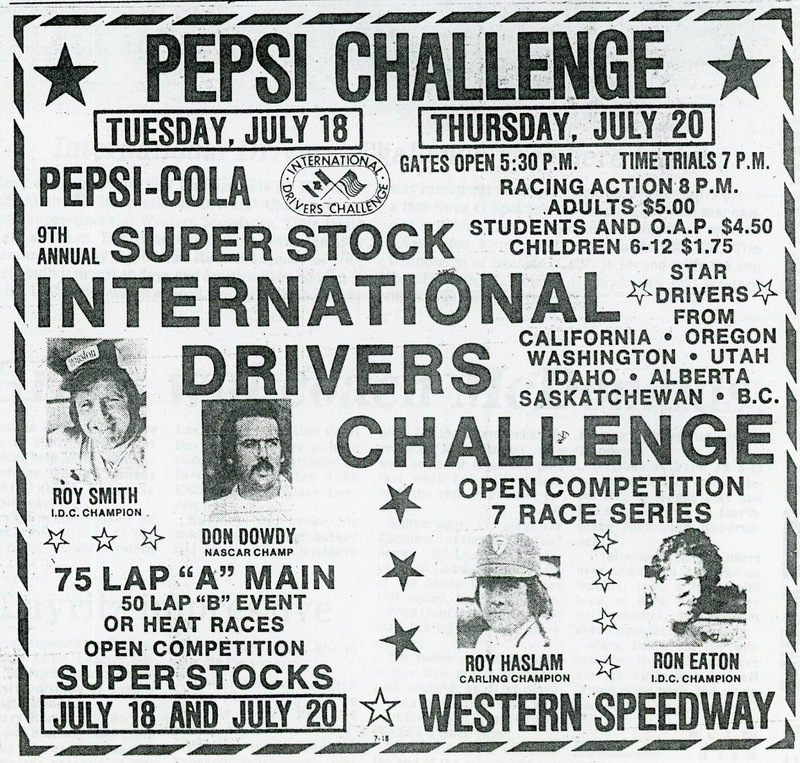 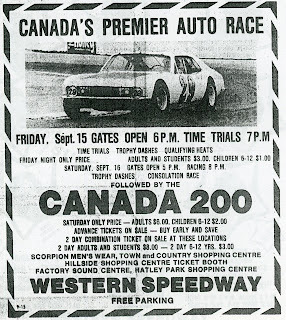 Results for the Canada 200, Western Speedway, 1978. 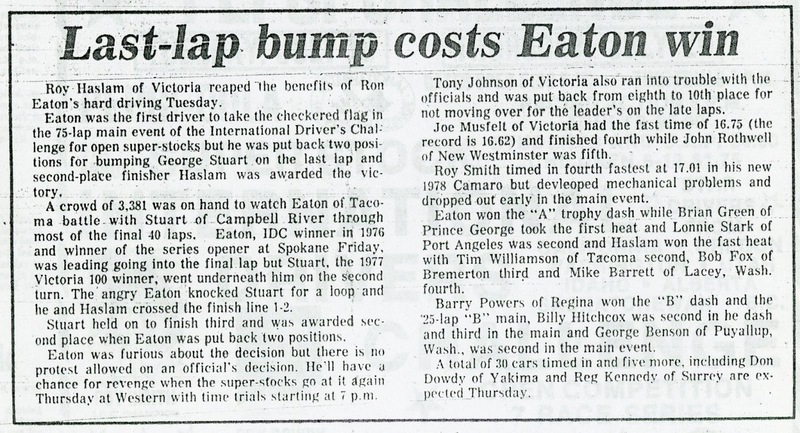 Roy Smith wins. 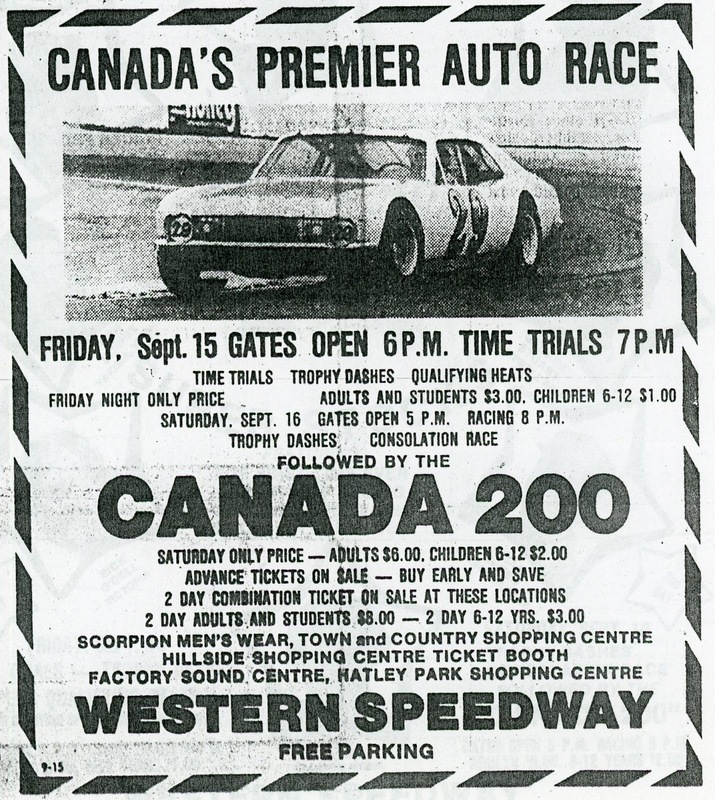 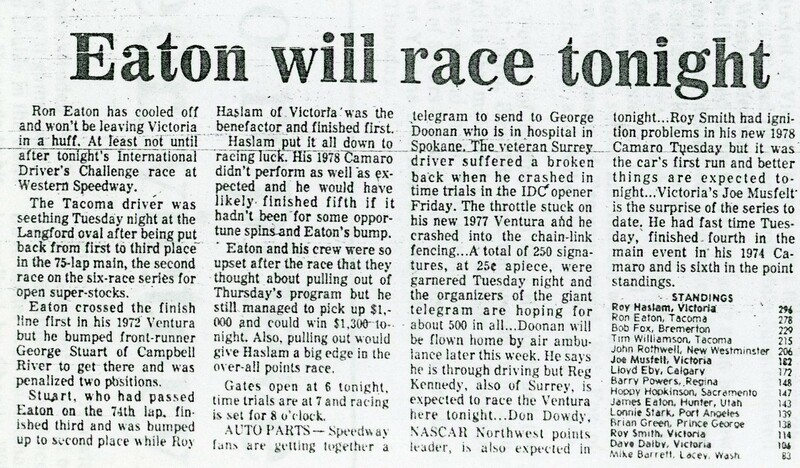 Another big race at Western Speedway for the 1978 season. 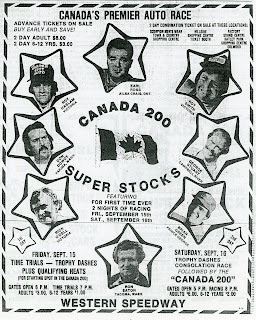 This one the Canada 200. 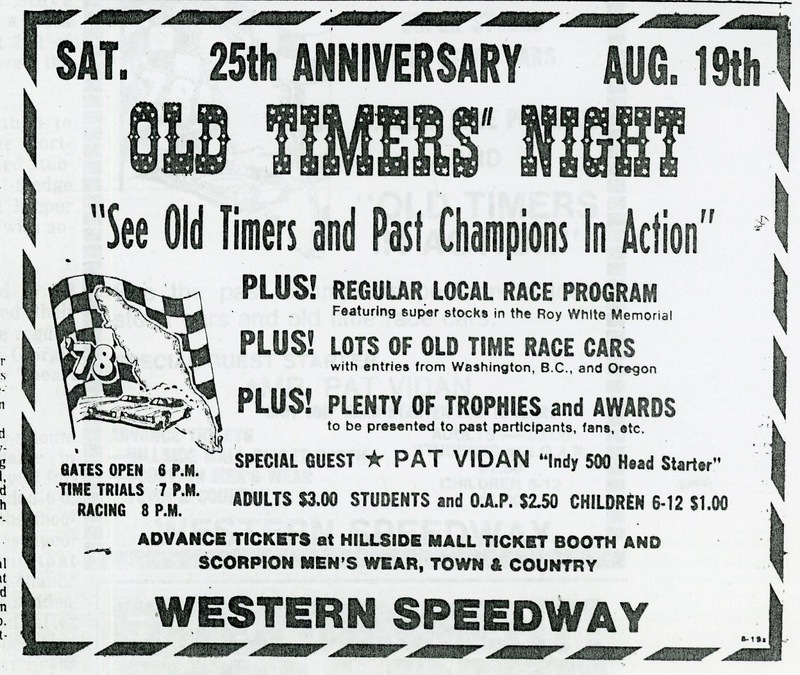 Results of the "Old Timers" race at Western Speedway. 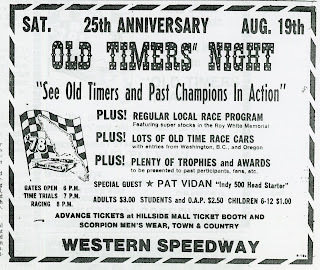 Some promo work for an "Old Timers" race at Western Speedway. 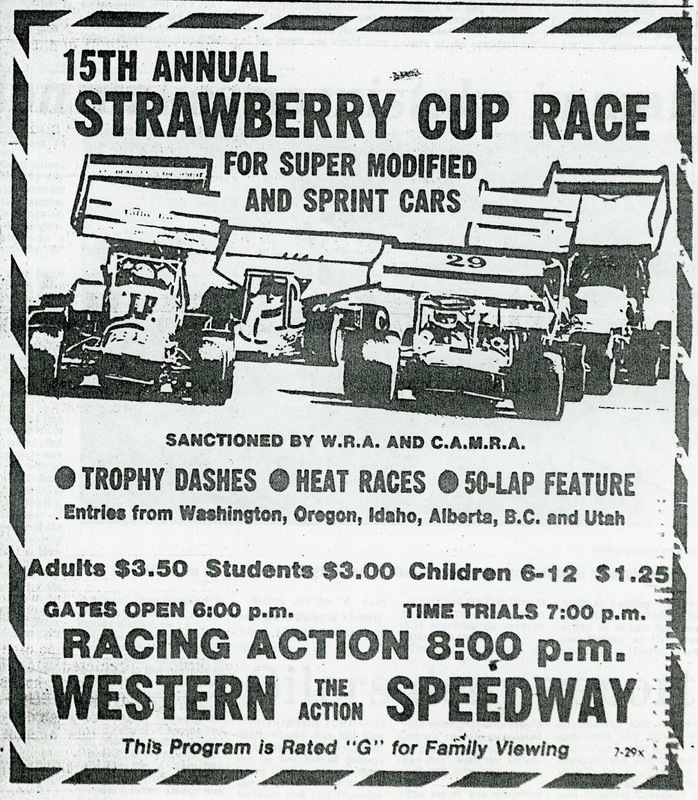 The IDC returns to Western Speedway. 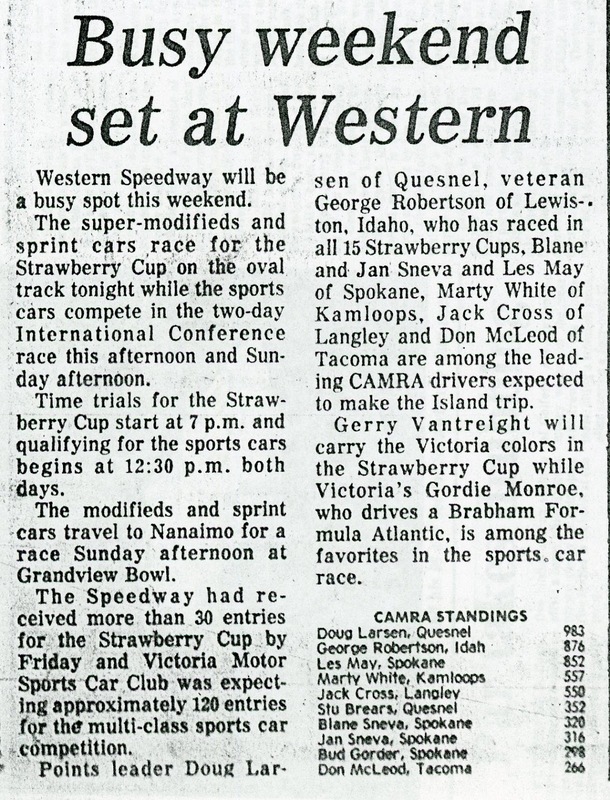 Some familiar names in the sports car results from Western Speedway. 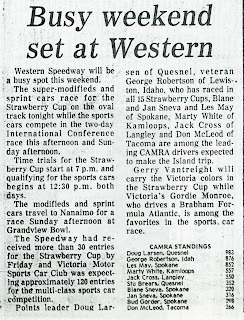 The results of the Strawberry Cup race at Western Speedway for 1978. 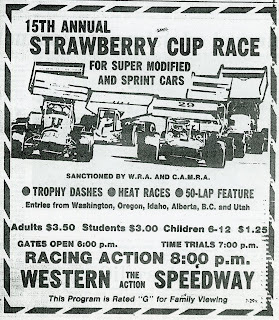 The 1978 Strawberry Cup at Western Speedway. 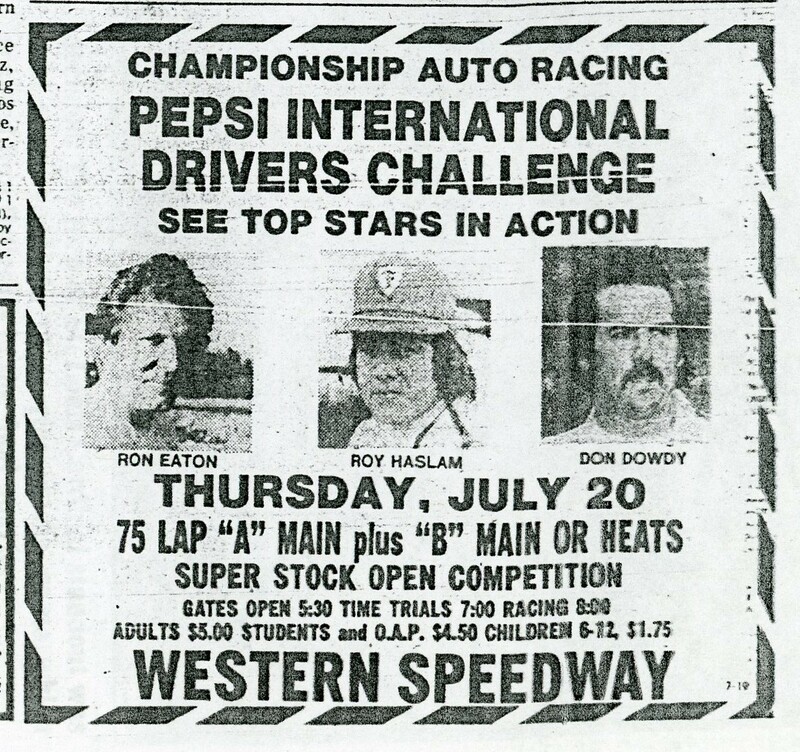 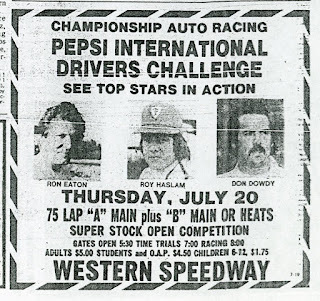 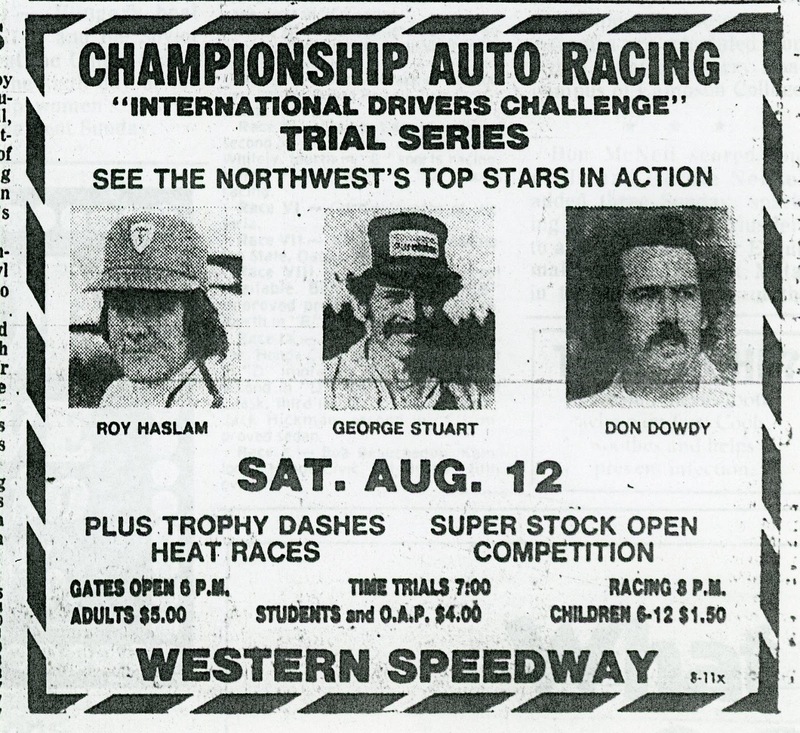 The July 20, 1978 IDC race at Western Speedway. 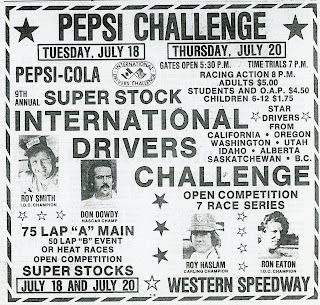 The July 18, 1978 IDC race at Western Speedway. 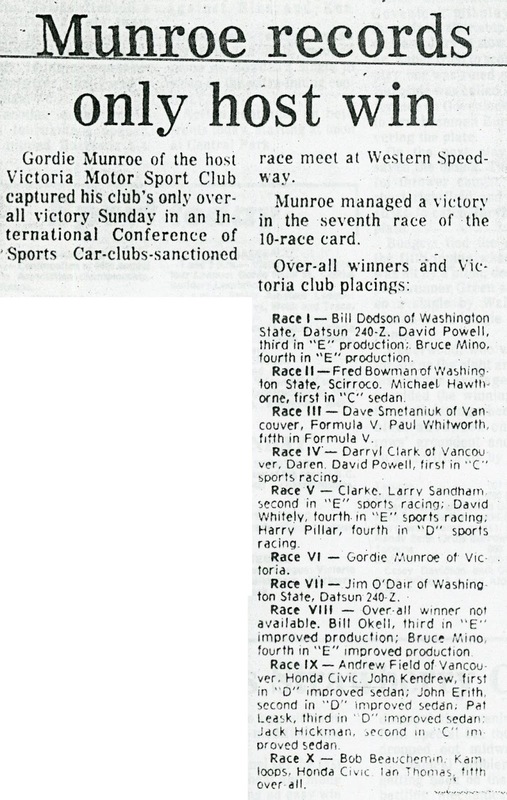 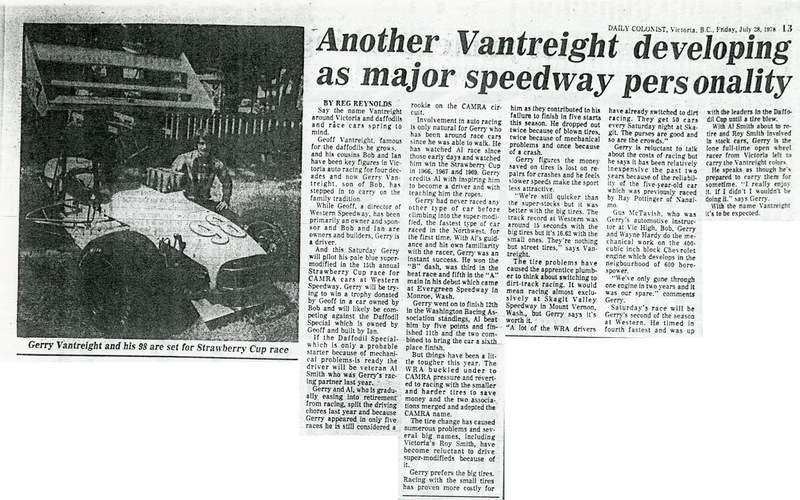 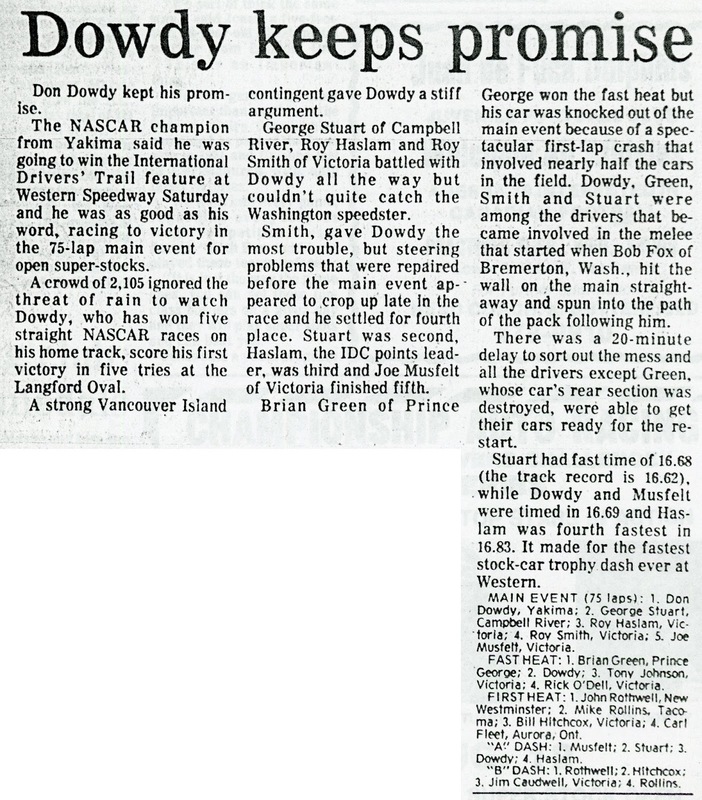 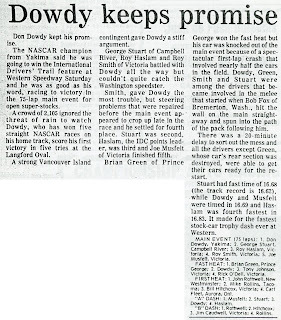 Some clippings from Victoria, BC's Western Speedway, 1978. 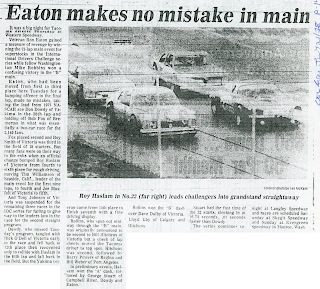 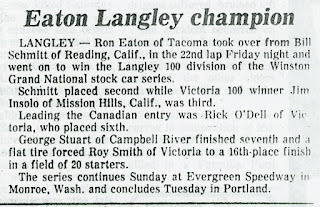 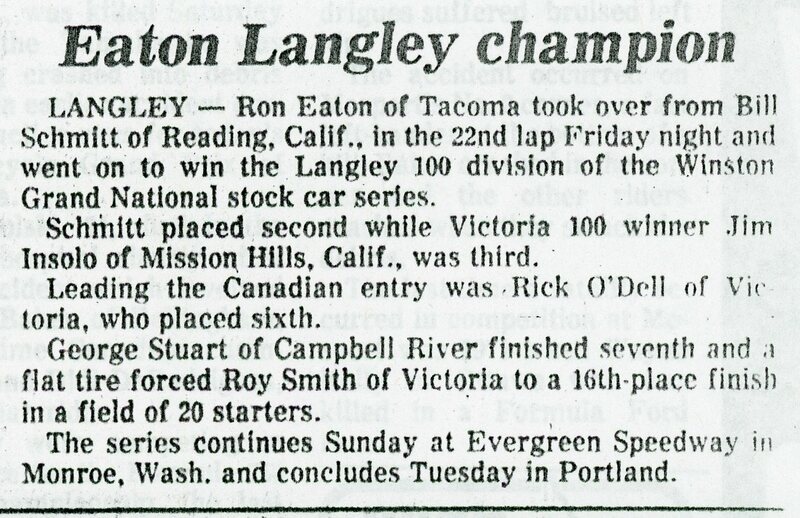 Tacoma's Ron Eaton winning at Langley Speedway.